Slack raised $250 million in September. The messaging company, valued at $5.1 billion, has now raised $841 million. The money will be useful in helping Slack expand internationally or simply as a cash pile. But Slack probably did not exactly need those $250 million, based on the fact that it hasn’t used the $360 million raised in previous funding sessions. Slack’s latest funding round shows how much easier it has become for tech companies to get cash from private investors. 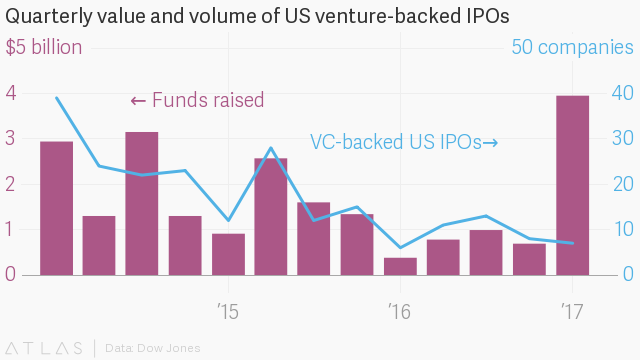 Slack’s latest funding round also explains why fewer companies are going public in the US. In 1996, about 8,000 listed companies went public compared to about 4,330 this year. With so much easy money coming from private investors, it makes less sense to go through the excruciating process of going public.